This publication signals the move of DCAT onto the W3C Recommendation Track. DCAT was first developed and published by DERI and has seen widespread adoption at the time of this publication. The original vocabulary was further developed by the eGov Interest Group, before being brought onto the Recommendation Track by Government Linked Data (GLD) Working Group. This document does not prescribe any particular method of deploying data expressed in DCAT. DCAT is applicable in many contexts including RDF accessible via SPARQL endpoints, embedded in HTML pages as RDFa, or serialized as e.g. RDF/XML or Turtle. The examples in this document use Turtle simply because of Turtle's readability. DCAT compliance means that a provider uses a subset of the DCAT vocabulary when publishing catalog and dataset metadata. This is likely to be the common case. 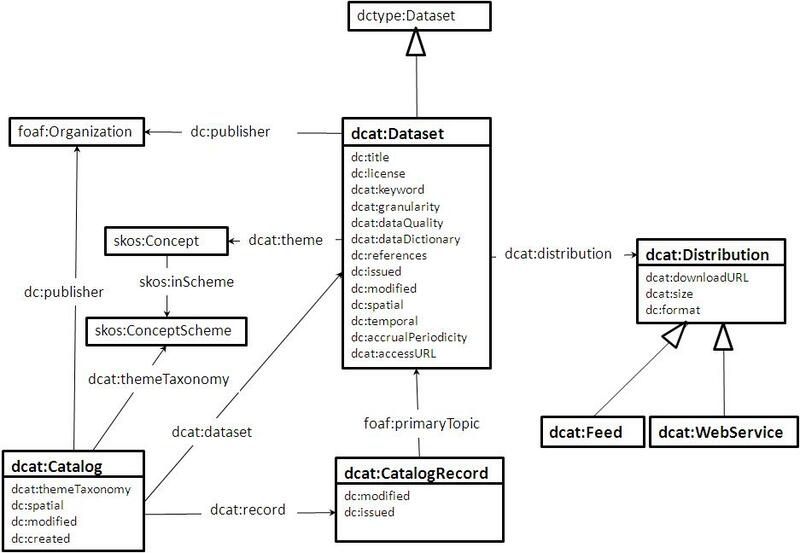 DCAT conformance means that a provider uses the entire DCAT vocabulary when publishing catalog and dataset metadata. The namespace for DCAT is http://www.w3.org/ns/dcat#. However, it should be noted that DCAT makes extensive use of terms from other vocabularies, in particular Dublin Core. DCAT itself defines a minimal set of classes and properties of its own. A full set of namespaces and prefixes used in this document is shown in the table below. dcat:Distribution represents an accessible form of a dataset as for example a downloadable file, an RSS feed or a web service that provides the data. Another important class in DCAT is dcat:CatalogRecord which describes a dataset entry in the catalog. Notice that while dcat:Dataset represents the dataset itself, dcat:CatalogRecord represents the record that describes a dataset in the catalog. The use of the CatalogRecord is considered optional. It is used to capture provenance information about dataset entries in a catalog. If this distinction is not necessary then CatalogRecord can be safely ignored. The dataset can be downloaded in CSV format via the distribution represented by :dataset/001/csv. Values like "unknown" or "unspecified" should never be used, and if present in the original database should be filtered for publishing. Instead, the property should simply be omitted. A data catalog is a curated collection of metadata about datasets. Usage note: Typically, a web-based data catalog is represented as a single instance of this class. The homepage of the catalog. Usage note: foaf:homepage is an inverse functional property (IFP) which means that it should be unique and precisely identify the catalog. This allows smushing various descriptions of the catalog when different URIs are used. The entity responsible for making the catalog online. The geographical area covered by the catalog. The knowledge organization system (KOS) used to classify catalog's datasets. A name given to the catalog. free-text account of the catalog. The language of the catalog. This refers to the language used in the textual metadata describing titles, descriptions, etc. of the datasets in the catalog. Usage note: Multiple values can be used. The publisher might also choose to describe the language on the dataset level (see dataset language). This describes the license under which the catalog can be used/reused and not the datasets. Even if the license of the catalog applies to all of its datasets it should be replicated on each dataset. Usage note: To allow automatic analysis of datasets, it is important to use canonical identifiers for well-known licenses, see @@@void guide@@@ for a list. A dataset that is part of the catalog. A catalog record that is part of the catalog. A record in a data catalog, describing a single dataset. Usage note This class is optional and not all catalogs will use it. It exists for catalogs where a distinction is made between metadata about a dataset and metadata about the dataset's entry in the catalog. For example, the publication date property of the dataset reflects the date when the information was originally made available by the publishing agency, while the publication date of the catalog record is the date when the dataset was added to the catalog. In cases where both dates differ, or where only the latter is known, the publication date should only be specified for the catalog record. The date of listing the corresponding dataset in the catalog. Range: rdfs:Literal typed as xsd:date. The date is encoded as a literal in "YYYY-MM-DD" form (ISO 8601 Date and Time Formats). If the specific day or month are not known, then 01 should be specified. Most recent date on which the catalog entry was changed, updated or modified. Links the catalog record to the dcat:Dataset resource described in the record. A collection of data, published or curated by a single source, and available for access or download in one or more formats. Usage note: This class represents the actual dataset as published by the dataset publisher. In cases where a distinction between the actual dataset and its entry in the catalog is necessary (because metadata such as modification date and maintainer might differ), the catalog record class can be used for the latter. Most recent date on which the dataset was changed, updated or modified. A name given to the dataset. free-text account of the dataset. An entity responsible for making the dataset available. Date of formal issuance (e.g., publication) of the dataset. The frequency with which dataset is published. Domain: dcterms:Collection so, a Catalog must be a dcterms:Collection as well. A unique identifier of the dataset. Usage note: The identifier might be used to coin permanent and unique URI for the dataset, but still having it represented explicitly is useful. Spatial coverage of the dataset. Usage note: @@@ controlled vocabulary. geonames??? @@@ The temporal period that the dataset covers. Usage note: @@@ controlled vocabulary. http://www.placetime.com/ might be an option??? The language of the dataset. Usage note: This overrides the value of the catalog language in case of conflict. The license under which the dataset is published and can be reused. Usage note: See Section 2.4 of Describing Linked Datasets with the VoID Vocabulary. Usage note: This is usually geographical or temporal but can also be other dimension e.g. Person can be used to describe granularity of a dataset about average income. A set of sample values used in data.gov: country, county, longitude/latitude, region, plane, airport. provides some sort of description that helps understanding the data. This usually consisits of a table providing explanation of columns meaning, values interpretation and acronyms/codes used in the data. Usage note: @@@ Review @@@ It is rarely provided in the current catalogs and does not have a consistent usage, however when it is provided it is a link to some document or embeded in a document packaged together with the dataset. It is recommended to represent it as a resource having the URL of the online document as its URI. Statistical datasets, as a particular yet common case, can have a more structured description and the on-progress work on SDMX+RDF can be utilized here. describes the quality of data. The main category of the dataset. A dataset can have multiple themes. Usage note: The set of skos:Concepts used to categorize the datasets are organized in a skos:ConceptScheme describing all the categories and their relations in the catalog. A keyword or tag describing the dataset. A related document such as technical documentation, agency program page, citation, etc. Usage note: The value is the URI of the related document. Connects a dataset to its available distributions. Usage note: This represents a general availability of a dataset it implies no information about the actual access method of the data, i.e. whether it is a direct download, API, or a splash page. Use one of its subclasses when the particular access method is known. points to the location of a distribution. This can be a direct download link, a link to an HTML page containing a link to the actual data, Feed, Web Service etc. the semantic is determined by its domain (Distribution, Feed, WebService, Download). If the value is always a URI, shouldn't the range be rdfs:Resource? Usage note: the value is a URL. The size of a distribution. Usage note: dcat:size is usually used with a blank node described using rdfs:label and dcat:bytes. Usage note: MIME type is used for values. A list of MIME types URLs can be found at IANA. However ESRI Shape files have no specific MIME type (A Shape distribution is actually a collection of files), currently this is still an open question? @@@. Represents a downloadable distribution of a dataset. Range: accessUrl of the Download distribution should be a direct download link (a one-click access to the data file). Represents a web service that enables access to the data of a dataset. Usage note: Describe the web service using accessUrl, format and size. Further description of the web service is out the scope of dcat. represent availability of a dataset as a feed. Usage note: Describe the feed using accessUrl, format and size. Further description of the web service is out the scope of dcat. The knowledge organization system (KOS) used to represent themes/categories of datasets in the catalog. Usage note: It's necessary to use either skos:inScheme or skos:topConceptOf on every skos:Concept otherwise it's not clear which concept scheme they belong to. Usage note: FOAF provides sufficient properties to describe these entities. As with all RDF models, the DCAT model can be extended simply by using additional RDF properties anywhere. Data catalog publishers may choose from properties in existing vocabularies or create their own custom vocabulary. Additional classes, from existing or new vocabularies, may also be used. Extensions used in a particular catalog should be documented to ensure that consumers of the data are aware of the additional available properties. Creating new subclasses and subproperties of terms used in dcat, such as new types of distributions, is generally discouraged because it can break SPARQL queries that data consumers use to query the data. As always with RDF, if you need to introduce new classes or properties, do not introduce new terms in existing namespaces "owned" by someone else, but set up your own namespace and define new terms in that namespace.